I lost my Leo 2 weeks ago and he was only 6. He brought so much joy to our family and friends. He was an amazing dog and knew so many tricks. Leo went everywhere with us but mostly he hung out on the dock where my dad keeps his boat. He'd wander onto the boat and then just lounge on the dock or jump in the water or run in the grass. He loved being around people, he loved all our friends and our friends loved him. He was the main topic of most of our conversations and even though he was about 35 lbs. he insisted he sit on your lap, and this was never a problem. He loved us so much and it didn't matter if you were in bed or at the computer desk or sitting on the couch, he had to be as close to you as possible. I miss him so much and the grief sometimes seems unbearable. His death was so sudden and unexpected. He was at the vet on and off for 3 days and they didn't know what was wrong. Although I thought for sure he would be coming home to us. They did surgery on him the 3rd day and the news was devastating. I wake up every morning and just can't believe it's not a horrible nightmare. We are going to have a party for him on the dock when we get his ashes back and he will stay on the boat, his favorite place. Comments for Leo "the dock dog"
I wanted to tell you I am leaving for the Coast Guard soon so I got dad a new pup. 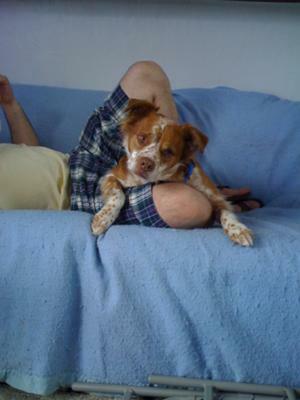 I searched for a pup that had a mix with brittany spaniel because I wanted him to look like you and have your temperament. I'm not quite sure what this dog is, mostly pointer I think. I wanted to make sure dad had someone to keep him company and to take care of him when I left. I was at ease knowing when I left that you would be there to be his companion but that can't be so. I do know you are here in spirit and we still keep you on that boat. Also, you remain the topic of many conversations. You would like this new pup. His name is Benjamin. He fits in well and has a goofy nature about him like you do. Leo, you will NEVER be replaced, dad still says you are the best dog he has ever had, and I couldn't agree more. It's been months now and I still think about you on a day to day basis. Walking into the humane society is heartbreaking and knowing I saved a life makes me happy. Benjamin was on his last couple days there and if it wasn't for us he wouldn't be in this world today. I know you would love and approve of him and play with him well. I love you Leo so much, you touched so many lives and brought so many smiles. I miss you Leo and will write again. I come here to read my memorial to Ned and to read how others are dealing with the loss of their friends. I feel bad that I never got to say good bye to Ned. When I went to see him at the vet after his first night there I thought he would be doing better. But when they came out and said he was gone I was devastated. I held his body for an hour and finally said good bye. This has been the hardest thing dealing with his loss. I know I will see him again as you will with Leo. Your memorial of Leo touched my heart this morning. Your descriptions of his character were so sweet, honest and clear to understand. Only those of us who were and still are fortunate to be owners of pets like Leo, could truly feel the loss that you are currently going through. I lost my Margo back in December 2008. Like you, I will never forget our eye contact with one another. I miss her terribly. I often read and often comment to those who have lost their companions. Though every time I read a new memorial, I am either in tears or pretty much close. I do experience a little more healing of my own loss, if I can offer some support to others. This site allows that to happen for all of us. It aids in the healing process and we don't have to forget about our pets. We can openly share and support one another. Thank you, Cynthia, for sharing a bit of Leo. I will never forget your memorial. I am a strong believer (now more than ever) that God has plans for our pets in Heaven. God created everything here on earth, including our pets. He is not a temporary God. They are in Heaven without a doubt. I lost Bella at just 2 1/2 years old and I still am devastated. But knowing that God chose her to be in Heaven tells me she must have been quite amazing. I am learning to love Bella in another dimension than I am used to. Although she is not here by my side she is with me in my heart and the memories we created. You will one day see Leo in Heaven...he must have been an amazing dog! Leo said goodbye to me when he knew he was leaving us. After the second day of being at the vet he came home very ill, although he was on antibiotics and we thought he was going to get better. He walked into my room and looked at me. I sat down and he walked over to me and leaned all his body weight on me and just sat there with his head on my chest. The actions were strange, and I should have known what he was doing. He was in so much pain that actually walking to my room was so difficult for him. I had no idea at the time the amount of pain he was in... the thought kills me. Although he never cried out in pain, he was so strong and brave. When we adopted him, he had previously been hit by a car and someone had the heart to bring him to the vet and have him taken care of. It was like he was so grateful to just have been given that second chance in the first place. I held him and talked to him and that was my goodbye to him. I didn't realize right then we were saying goodbyes though, and he went the following day to the vet without me even seeing him before he left, me just assuming he was coming home that night. I will never forget that day how he just kept looking at me, his eyes were so sad. Why was he taken from us at such a young age? Our bond, my dad's bond with him, it was stronger than I even knew. I just read your story about Leo and the sudden loss you are going through. I lost my dog Bella on March 28, 2009... suddenly. She was fine all day, I spent all day with her with the exception of 1 1/2 hours while I went to the store. When I came home she was on her bed like she was sleeping... she had passed away. Yes, the pain is so unbearable. I encourage you to get the book "Cold Noses at the Pearly Gates." Very good book, I am reading it now and it does help. I am still in a state of shock. But I am getting to a point where I want to honor the love I have for Bella.